I'm Here. I'm Queer. What the Hell do I read? : Caught Inside - Luke spends a summer surfing and, to his surprise, falling for a guy! 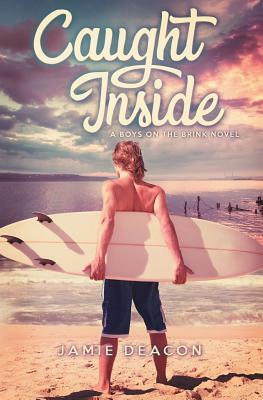 Caught Inside - Luke spends a summer surfing and, to his surprise, falling for a guy! Luke believes he has his life figured out...and then he meets Theo. It should have been simple - a summer spent with his girlfriend Zara at her family's holiday cottage in Cornwall. Seventeen-year-old Luke Savage jumps at the chance, envisioning endless hours of sunbathing on the private beach and riding the waves on his beloved surfboard. He isn't interested in love. Though his rugged good looks and lazy charm mean he can have his pick of girls, he has no intention of falling for anyone. Nothing prepares Luke for his reaction to Theo, the sensitive Oxford undergraduate who is Zara's cousin and closest friend. All at once, he is plunged along a path of desire and discovery that has him questioning everything he thought he knew about himself. No one, especially Zara, must find out; what he and Theo have is too new, too fragile. But as the deceit spirals beyond their control, people are bound to get hurt, Luke most of all. My thanks to Jess for the heads-up on this. Add your review of "Caught Inside" in comments! Your cape is ready. Join me.